Last week, while chatting around my kitchen table with a friend, she pulled out her phone and proceeded to play a round of Temple Run while we continued our conversation. Taking a cue from her, I whipped out my phone and began playing as well. And there we sat, talking as we individually played our games; eyes on our phones, concentration focused on not running into a tree or getting attacked by demon monkeys. As a non-gamer (I am reluctant to identify myself even as a casual gamer), this was an extremely unusual situation for me to be in. I have never connected with friends over Xbox LIVE or hung in on a Friday night playing Mario, but I am increasingly finding myself in situations where I am bonding and interacting with my friends over an iOS game. I have never, ever, been a “gamer.” I may have dabbled with some Sims or Guitar Hero, but prior to installing Temple Run I had gone years without repeatedly playing any videogames. While a love of videogames was something I could conceptualize, comparing it to my love of books, it was never something that I personally experienced. I blame that on my horrible hand-eye coordination. There are roughly 100,000 games currently available in the App Store. The mobile gaming market has grown exponentially in recent years, garnering attention from people who have never owned a console or handheld gaming device, but who own a smartphone. The smartphone has quickly captured a previously untapped market of gamers, getting Dad — who hasn’t played a video game since Centipede at the arcade — to spend spare moments slinging birds at pigs. Recently, the success of mobile gaming has even sparked discussion on the end of handheld devices. As an iPhone owner for years, I still was never attracted to the games that entertained my friends, using my phone primarily for email and, well, phone calls. There was a gaming revolution occurring around me, but I was primarily immune to the draw of the game. 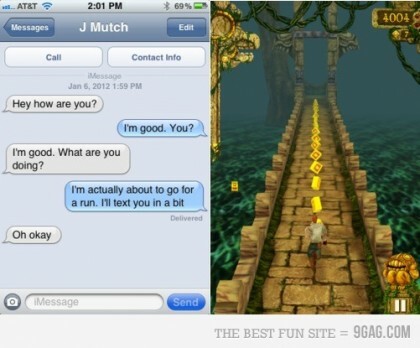 What about Temple Run changed it all for me? As a self-proclaimed non-gamer, I base my addiction on its quick and consistent gameplay. I can pick it up on my two-minute subway ride or do back-to-back runs for an hour and it’s the same enjoyable game. Graphics are irrelevant to me. As someone who has never consistently experienced the almost life-like animation of certain console games, the visual gaming components are not high on my list of importance. Instead, it is the extremely simple, repetitive, yet exciting gameplay that keeps me starting up the only game I have on my iPhone. And small allusions to my childhood fictional idol — Indiana Jones — didn’t hurt at all. *Imangi, the studio behind Temple Run is a TriplePoint client.